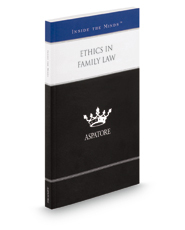 Ethics in Family Law provides an authoritative, insider's perspective on best practices for advising clients during the often emotionally charged family law matters. Partners from some of the nation's leading law firms guide the reader through the most common family law disputes – including divorce, custody and timesharing, payment of child support and alimony, and division of marital assets – each of which requires both clients and their representation to conduct themselves is an ethical manner. These top lawyers reveal their proven methods for assisting clients through the legal, financial, and emotional challenges family law cases often present, while also understanding their own limitations and providing access to the other professional resources clients may need. Additionally, these leaders discuss how social media and other new technologies have impacted the practice of family law and present strategies for preserving the high level of ethical conduct expected of family law professionals. The different niches represented and the breadth of perspectives presented enable readers to get inside some of the great legal minds of today, as these experienced lawyers offer up their thoughts on the keys to success within this challenging field.